Open to BCC members rated under 1800. Entry fee: $20. First two winners receive free entry into the Reubens/Landey U2200 BCC Championship. The Weaver Adams U1800 Championship begins the annual club championship cycle. It is followed by the Reubens-Landey U2200 Championship, the winner of which is seeded into the club championship - a round robin tournament of Boylston masters. Weaver Warren Adams was born on April 28, 1901 in Dedham Massachusetts. He was an American chess master. He participated in the U.S. Championship in 1936, 1940, 1944, 1946 and 1948. He won the Massachusetts State Championship in 1937, 1938, 1941 and 1945. In 1939, he wrote a book entitled "White to Play and Win." After publication he played in the U.S. Open at Dallas. He did not win a single game as White (3 losses and 1 draw) and won all his games (4 games) as Black! Weaver Adams won the 49th U.S. Open, held in Baltimore, in 1948. He also wrote "Simple Chess", "How to Play Chess", and "Absolute Chess." In May, 1947, Weaver Adams, New England Champion, gave a 16-board simul in San Jose, winning all his games. I was born on April 28th, 1901 to Frank H. Adams, native of Dedham, Mass., salesman for many years for Bellantine Breweries and later (after prohibition) for Ceresota Flour, and Ethel Weaver Adams, native of Newmarket, NH and graduate of Wellesley College. I am not directly related to the Presidents, John and John Quincy Adams, although the Adams's in and about Massachusetts are mostly of the same family, deriving from a Henry Adams who landed in Braintree in 1644. The family is quite famous and boasts of many statesmen, writers, historians, judges, preachers, etc. Footing the list comes a national chess champion. In the old days he would have surely been branded as a black sheep for wasting his time at so idle a pastime, and perhaps by many even today. My schooling was conventional, Dedham Public schools and Dedham High School, but then they tried to make an engineer out of me by sending me to Massachusetts Institute of Technology. The result was not too good. 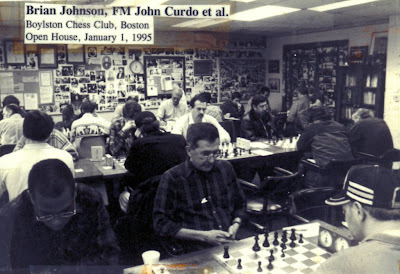 During the first year a half dozen of us, after playing a few games at Walker Memorial in Cambridge, would regularly trek across the bridge to Ye Olde Boston Chess Club on Ashburton Place or to various dives in the West End, not the least attractive of which was the Lighted Lamp operated by Boston's famous Ambrose Gring. Those were really the balmy days of chess in Boston. Well I remember listening to tales told many times over by John Barry, Will Miller, George Babbitt, and a host of others most of whom are no longer living. I seemed to have been a favorite with John Barry because I would talk chess and analyze with him until 4 A. M. in the morning after everybody else had either gone home or turned to a bridge game. At any rate I believe I learned most of my chess from Mr. Barry, and in 1922 attained to the club championship. An autobiography is supposed to contain a statement as to when one learned chess, although it's not clear as to why this is so important. However, for the sake of the record, I began playing at the age of about twelve. An older brother of a friend next door taught the two of us to play, and would play us both simultaneously blindfold at Queen odds. What I do think is important, however, is the time when he took us to Boston once to visit the Boston Chess Club which at that time was located in an alley off Boylston Street. I shall never forget the thrill it was to me to see for the first time the large club size pieces in action. Instinctively I seemed to feel that that was me. A friend of mine tells me that he had a similar experience on first visiting a stock exchange and seeing the ticker tapes in action. Curiously, all the rest of his life has .been spent in the stock market. My chess activities , of course, did not have a good effect on my marks at M.I.T., and, due redness of my report card at the half year, I was politely asked to take a vacation. This I was quite agreeable too, since it afforded me additional time for chess playing. A year went by before my parents inveigled me into attending a military school in northern Vermont, and, six months later, re-entering my class at M.I.T. All knowledge is useful, and it is always futile to look back and say if we had done so and so, life would have been better. It is completely impossible to foresee the over all plan. We can live but a day at a time. To continue my story, about 1924 Harold Morton had just won the championship of the Providence, R. I., chess club, and a purse was gotten up for a match to take place between Mr. Morton and myself for the championship of New England. Up to that time John Barry had been unofficially recognized as the strongest player in N. E., so, with his consent and approval it was logical that the winner of the match should hold that title. Thus, in 1924 I became the NE Champion and held the title until 1929 when Morton beat me in a succeeding match. Another match between us did not take place until about 1938 which Morton again won. After his death in 1939 the title came under the control of the N. E. Chess Association and has been decided by an annual tournament (usually held over Labor Day weekend) ever since, which is all to the good, since I am strongly opposed to the awarding of titles through private matches. The tournament method is pre-eminently fair and much more attractive to both the players and the public. Thereby closes the local chapter in my chess career. 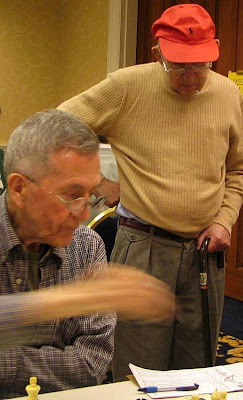 At this time – say 1936 - I think that both Morton and myself - I know I did - thought that we were pretty good chess players. We were in for a rude awakening. In that year (1936) was held the first tournament for the Chess Championship of the United States, due to the retirement of Frank J. Marshall. I recall that after the first few rounds I kept figuring that I might still win the tournament, provided I won all of the remainder of my games. In fact, this went on for several rounds, before I finally gave up hope of first prize. After nine rounds I was relatively proud of my score, since I had three wins and six losses, while Morton had nine goose eggs in a row. However, we finished in a tie for last place, since in the remaining six rounds Morton got six draws, and it was my turn for goose eggs. I mention this experience in order to caution the reader that unless he happens to play regularly in the chess clubs of New York City, he shouldn't put too much store by his showing in the chess clubs of other cities. There is really a difference. In a considerable sense I feel that my serious chess playing did not begin until after 1936. Hundreds of hours I spent on opening analysis, with the result that there began forming in my mind the idea that by means of precise play White could perhaps emerge from the opening with just enough edge to win. Thus developed a small volume published in 1959 by the David McKay Co. of Philadelphia entitled "White to Play and Win", by Weaver W. Adams. Forthwith, in a tournament at Dallas, Texas in 1940 I proceeded to lose all of my games playing white and win all of my games playing black! However, I still stick to my theory, and even under the handicap of bucking my own analysis (most writers sedulously avoid playing a move which they have recommended as best, because of fear of having to play against a line which their opponent has prepared against it) and despite the hours which I am advised that many of my opponents spend in trying to discover mistakes in my published variations in "Simple Chess," I nevertheless lost but a single half point with the white pieces in the Open Tournament at Baltimore in 1948. And it wasn't because the boys didn't try. There were my moves open for all to see in "Simple Chess." They could select any one of a hundred different opening variations and I would play the exact moves as published. Is this not just a little significant that white can win? And, if so, why is my favorite opening the Vienna, so damned by faint praise, and so shunned by all the celebrities? You answer that one. I can’t. I don't wish to take up space by tournament records. All in all, they could be a lot better, except perhaps locally, inasmuch as I have won every City of Boston, Massachusetts State, end New England tournament in which I have taken part since 1956 - some dozen or more altogether. I will merely say that having played in eighteen national tournaments, including U. S. National, U. S. Open, Ventnor City, and the Pan American in Los Angeles in 1945, I feel that this experience should mean something, and I hope eventually to demonstrate that it is possible to play chess with consistent scientific accuracy. The following is an example of such a game. It is one of five which I have thus far played with similar accuracy for the Log Cabin Chess Team of West Orange, New Jersey, of which I have recently become a member. It was played at Elizabethtown, New York, vs. a Montreal Team, and was part of the coast to coast 1949 match between Canada and the U. S.
Alex Cherniack has posted 8 games between Weaver Adams and Harry Lyman, where you can see Harry Lyman 's opinion of the forced win for white theory. 200 Grand Prix Points (enhanced)!! Awards ceremony to follow round 9. Every player will receive a special prize. USCF and FIDE-Rated. IM/GM Norms may be possible. 70 players attended this year's Mass Open in Boxborough, about 10 people less than last year. presenting a plaque to John Curdo commemorating John's first of 17 Mass Championships 60 years ago at the age of 16. 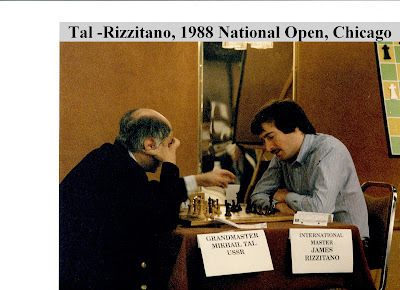 The most watched battle, was a game between Jim Rizzitano and Paul Mac Intyre that went the full 6 hours, both players having equal winning chances, with MacIntyre the victor in the time scramble of a complex ending where both sides queened pawns. 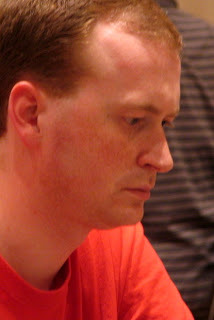 Denys Shmelov won the Open Section - becoming the 2008 Massachusetts Champion. John Elmore of NH the U2000, Avery Chen of CT the U1800, Larry Kleine the U1600. 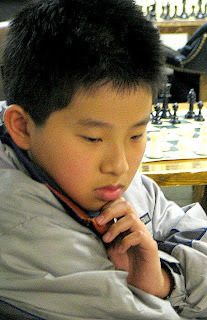 In the one day (attendance 30) Howard Goldowsky and Darwin Ding won the U2000/Open, with David Todd and Chirantan Neogy winning the U1300 . 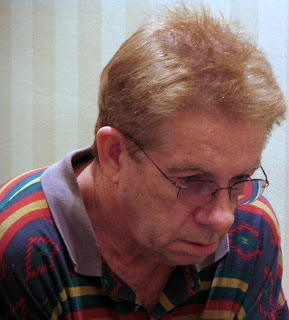 Bill Kelleher went undefeated with 10 wins in Blitz (attendance 10). Walter Champion funded a best game prize TBD. There were also scholastic events this weekend as well: K-6 Under 1400 Alexander Sorets won and K-6 Under 800 Jenny R Qiu won by tiebreak over Sathwik Karnik. While K-3 U12K was won Arnav Ghosh in a tie break over Henry Li, and K3-U600 was tied by Afareen Jaleel and Bridget Fox (attendance 64). MACA election results: President: Maryanne Reilly (88 votes); Vice President: Donna Alarie (84 votes); Treasurer: Robert Messenger (92 votes); Clerk: R. Kenneth Ballou (87 votes); DIRECTORS: (elected) George Mirijanian, 93 votes; Steve Frymer, 88 votes; Stephen Dann, 80 votes; Beebe Wiegand, 73 votes; Joseph Alfano, 71 votes; Brian Lafferty, 70 votes; Brian Mottershead, 69 votes; Robert King, 63 votes; Margaret King, 60 votes. MACA VP Donna Alarie carried most of the reporting duties in the MACA annual meeting asking for volunteers to help with various tasks performed by Maca. Donna pointed out that the increased expenses of the magazine Chess Horizons created a deficit of several thousand dollars and the MACA executive and directors have to come up with a strategy to meet this budgetary drain, but keep the magazine. Discussions revolved around the possibility of an electronic version of Chess Horizons. This deficit was absorbed due to funds in investments. Donna asked for help in reviewing MACA's investment strategies that were previously managed by the late Gus Gosselin. Currently there about 250 adult MACA members as numbers keep falling. How do you feel about Chess Horizons? How should you react when you blunder? "If you've made a mistake, or committed an inaccuracy, there is no need to become annoyed and to think that everything is lost. You have to re-orientate yourself quickly and find a new plan in the new situation"
Many of my games have collapsed like a house of cards following a blunder - throwing a great position away after hours of hard work. Paul Keres also stated that you should let it go, collect yourself, and take a new cold objective look at your current position making new plans. Jeremy Sillman, Mr. Imbalance, says you should take inventory of the imbalances due to the error. All of this is easier said than done. How should one act after making a blunder? I think most people immediately get up and walk away from the board after making a mistake. This has happened so often to me that when my opponent suddenly gets up and walks away I take an extra long look. Myself, I try and keep a poker face, although I admit I have emotionally reacted right after making a mistake especially when I know I just threw the game away. a stupid mistake" is first recorded 1711. Another interesting category are the occasions when your opponent has not taken advantage of a winning situation they have. I remember a battle with the late George O'Rourke, whereabouts the 5th hour I was staring at a very subtle mate in 7 and it was obvious my opponent was focused on queenside activity thus missing it and me sitting: poker face, poker face. I won that game around an hour later, around 1am in the morning. Similarly against my nemesis Mikhail Derazhne, had to sit with a poker face staring at mate, later going on to win. Another interesting category of this type is when you make a losing blunder, which your opponent misses, and this creates such an unbalanced situation in the position that you actually obtain a forcing winning advantage due to not being punished. The most demonstrative response I ever remember was when Jack Martin; having dropped a pawn scrambling in a critical situation against me; slowly got up, slowly stepped away from the table, took off has ball cap, threw it on the floor and drop kicked it down the isle al la Earl Weaver. How do you react to blunders? Do you have any interesting stories about blundering? Do you have a better term for blunder than blunder? Perhaps you can help me. I have on at least two occasions been questioned on my use of the title "NM" when referring to players whose current rating is below 2200. My understanding is that once a player has attained a published rating of 2200+, they have earned the title "National Master", and that once titled, always titled. definition of the various USCF titles on the webpage. In the past I have queried this, and received a good explanation, including FIDE definaitions, but I can't find it in the rule book or web page. You are correct in that players never lose their titles. As for the USCF titles, the two over the board titles are National Master (obtained by reaching 2200 USCF) and Life Master (obtained by playing 300 games at 2200 or higher). section on the USCF website in the near future. Thanks for your inquiry. Thank you and Joan for your speedy and clear response. I appreciate that you will post a notice about titles on the FAQ site. So, my understanding from this correspondence is that once a player has acheived a published rating (even in a monthly or bi-monthly supplement), the title of National Master has been earned. And even if the rating drops back below 2200, the title remains. Once titled, always titled. There are no ex-masters. The 9th annual Paramount at the BCC is completed. A 10 round double-round robin founded by Brian Clark, the Paramount is one of the few tournaments in the calendar that includes adjournments. This year expert Brian Salomon won the first section with 9 points. Congratulations to the winners and all the players. The esteemed BCC President Paul MacIntyre swooped in for a rare weekend appearance and takes first place. His win over Chris Chase in the third round ended Chris's string of BCC tournament victories, but I'm sure this is only a temporary setback. Ten players braved the blistering pace of the G30 Wednesday night quads, which is now a club WEEKLY event. Laywer Times won the top quad 3-0, while Adam Pittman took top honors in the 2nd group. The biggest upset victory was Natasha Christiansen's victory over Greg Kaden, whose rating had been soaring (almost 200 points in a year and a half!) from 2000, when I met him back in 2007, to a brief spell at 2200 in April. Expert floor to flirting with master in a year -- what's your secret Greg? Maybe Natasha knows the secret, too-- her rating recovered 100 points in a month! Twenty-five players tackled the ever-popular Saturday G60 Quads at the BCC. Game in 60 minutes is no leisure walk, especially when facing players of similar rating. The top section of 4 masters* saw a tie between Chris Chase and Chris Williams at 2.5 each. Quad#2 was won by Ben Goldberg, who slashed through three other experts to acheive a perfect 3-0. Quad#3's victor was Afranio Soares, whose Harvard Square seasoning paid off in spades. Jesse Nicholas's razor sharp tactics in a Silician Dragon claimed a 200 point ratings upset win against Jason Rihel in quad 3, the biggest upset of the day. Quad#4 was won by the popular BCC blogger Mike Griffin, who held the top spot despite a first round loss. Quad#6 was taken by Alexander Lee with a perfect score. If you attended these events, and have stories to relate, please share them. I can only add what I saw personally, and I would love to hear other vignettes from these events. * May 21st- An earlier version of this post included the phrase ("and ex-masters"), but it has been clearly established by Bob Oresick's research and post(see above) that once a master, always a master. This Friday at the Blackstone Chess Academy, two time Dos Hermanas Champion Jorge Sammour-Hasbun is giving a lecture at 7:00pm. This lecture is free for BCA members, and only $10 to non-members. Following the lecture is a blitz tournament, Game 7 (5-2s), starting shortly after 8. Entry fee is $7, $5 for BCA members. Prizes $100based on 20. Non-members can enter the tournament and attend the lecture for only $12! Sets provided, bring a clock if possible. The Blackstone Chess Academy is located at the To Kalon Club, 26 Main Street, Pawtucket RI, just off the highway (95). Thanks, and pass this along to your chess friends! I can count beyond my hands and feet male players who have left chess when they developed a special relationship with a particular female. I don't want to sound sexist but I have not known of the reverse to happen. And I'm not going to name names for fear of getting beaten up or something. And I have to admit that I have a deal with my wife to not play chess during the summer on the weekends when the weather is good enough to go to the beach. I hear stories about divorces because of chess but I don't buy it, there is probably more to each story. I doubt that the divorce rate of chess players is higher than say hunters or poker players. There seems to be three major phases in a chessplayer's life where giving up OTB has a high probability. First, late in high school about the Junior year when college takes on a big piece of life and in addition chessplayers seem to figure out how to deal with girls around that age. Next is when a player begins to have a family; I retired from OTB chess for 19 years while my kids were growing up. It took a wife getting her master's degree and my kids not wanting to spend time with their crazy old man, to get me back to OTB. I wish there was a way to reach out to people in this group, because I do feel there is an opportunity to bring them back if we knew how to find them. Then I have seen many boomers drop out of chess when they see their skills slipping, getting beaten up too may times by these highly coached wunderkind, or they begin a new relationship. In fact the USCF is concerned that boomers are dropping out at an accelerating rate while youth is not replacing this drop off, causing a slowly increasing decline in the demographics that is the biggest threat to OTB. If I could transfer any experience into other chess players it would be the exhilaration one has playing well in a several day tournament, class prize for me, when round after round you sit across the board and ask yourself "How am I going to beat this guy?" And some how it's the last round and you are playing for the 1st prize and you win. I wish everyone experiences this at least once in their life. In an attempt to discourage people considering stopping OTB chess all together, I try and persuade them to go into "weekend warrior mode" -- set the goal to play in a few tournaments a year out of shape. Budgeting time so that you can participate weekly or routinely during a week night which might help to keep skills up. Personally I guess I'm in a type of this mode, attending the Quincy Chess Club every Tuesday night, when work doesn't interfere. Contrary to the above phenomenon, there was a time when the Quincy Chess Club actually attracted a wave of women who were looking for eligible bachelors. These women were older successful professionals apparently networked, and somehow got the idea to visit the club. These chess groupies seemed odd, but when you think about it, it made better sense to look for single guys in a chess club rather than a bar. You would probably find some pretty bright people at a chess club, albeit some socially challenged. In fact a couple of the women did find Mr right there, and chess subsequently lost those guys. So lookout for older chess groupies they could be harmful to your game. What are you feeling about chess and women? Any ideas to save the boomers? Or anything else? Clearly John Curdo is a chess legend. If John Curdo was a pro ball player, who would he be? To date Curdo has won 807 tournaments over more than 60 years. Won the Mass Open over 17 times (we say "over 17" because our record keeping is so poor). Cy Young with 511 career victories had an average of 24 wins for 21 years is the baseball player closest I can think of. I bet John Curdo easily won about 4000 wins which is 67 wins per 60 seasons. And still going. Saturday 10/02/2004 early morning I head west on the Mass turnpike. Memories of my playing on the Westfield Chess Team/Club flash in my mind. I turn off at the Palmer/Ware exit now heading on North Main Street Palmer and stop of at RA Manley & Sons Plumbing Supply to talk to past chess teammate Ron Manley who is stuck watching the store and won't be playing in today's 2nd Annual Palmer Open. But he said he will drop in. Saying goodbye I head up to the Grange Hall that has conditions right out of the past: the hall is a dark musty building of wood construction of 100+ years old. Logistics for an exerb tournament is trickier than in cities or suburbia where venues are more static. The director has to show up very early to places like this and deal with the conditions as presented. Set up the computer and make sure that chairs and tables are arranged ok. Move the cows out of the parking lot if necessary(only joking). You have to be more patient with the directors out here as they don't direct very often and it takes a little longer to work through things. It's time for round one and the director Ed Kostreba is beside himself as the open section has only four players for three rounds. I say I'll play up if it will help. In fact there are 4 sections and only 25 players which make things complicated everywhere because the players don't want sections to be combined?! In 2003, the previous year, The 1st Palmer Open had 38 players and Alexander Ivanov blew away the field. I think Ivanov's biggest challenge of that day was finding a good cup of coffee. My Westfield State chess coach/sponsor Dr. Les Hutton was playing in the u1600 section and we had a nice reunion. Round 1 I got a 1 point bye being in the Open section; round 2 - I faced a mid 1800 opponent and won a nice game. John Curdo was the strongest player that day. I watched as Curdo created positions so tense they looked painful to look at, then blam they explode in Curdo's favor, winning his first two rounds. Final round to be paired: I have two points and Curdo has two points, we are the leaders. We expect to face each other. This will be my first time to face John. My former teammate Ron Manly broke away work to watch me play the last round. When the parings went up John and I were NOT pared against each other?! We went up to the TD and simultaneously asked what's going on? TD said that people would have to play each other twice in order for us to face each other. And that's not going to happen. So I was paired against a mid 1900'ds player, me with Black played a French defense and got to successfully blow him up with a nice bishop sac on his h2.John made short notice of his opponent as well. I WAS CO-WINNER OF THE 2nd ANNUAL PALMER OPEN WITH JOHN CURDO! My grandchildren will hear about this, probably too many times. John, classy guy that he is, gave me a hearty hand shake and congratulations. Later that summer at a college reunion I met several of my Westfield State chess buds and they congratulated me on being so lucky as to not having to face John Curdo. What ball player or athlete would you equate John Curdo with? Do you have any good Curdo stories? A belated happy birthday at the suggestion of Ben Goldberg. Andor (Andre, Andrea) Arnoldovich Lilienthal (born May 5, 1911) is a Hungarian chess Grandmaster. In his long career, he played against ten world champions, beating Emanuel Lasker, José Raúl Capablanca, Alexander Alekhine, Max Euwe, Mikhail Botvinnik, and Vasily Smyslov. 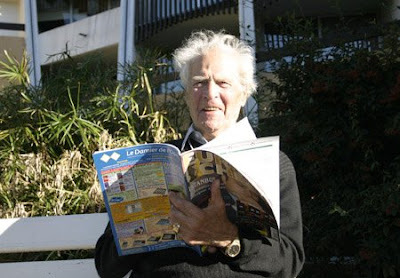 Lilienthal, who celebrated his 97th birthday on May 5, 2008, is still active, in good health, driving his car, and writing articles for chess magazines. 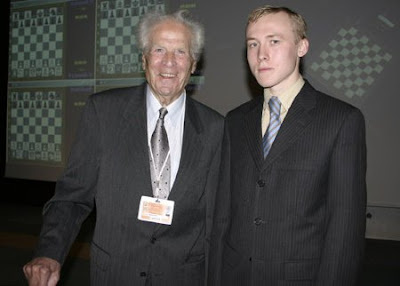 As of 2008 he is the oldest living Grandmaster. Lilienthal was born in Moscow to Hungarian Jewish parents and moved to Hungary at age two. He played for Hungary in three Chess Olympiads, 1933, 1935, and 1937. Emigrating to the Soviet Union in 1935, he became a Soviet citizen in 1939. Lilienthal played in the USSR Chess Championship eight times, with his best result being a first place tie with Igor Bondarevsky in 1940. He qualified for the Candidates Tournament once, in 1948. From 1951 until 1960 he was Tigran Petrosian's trainer. 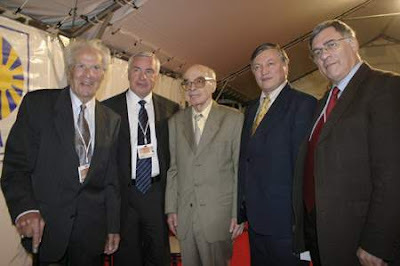 Lilienthal began a friendship with Vasily Smyslov in 1938, and was Smyslov's second in his world championship matches against Botvinnik. He retired from tournament play in 1965 and returned to Hungary in 1976.